The Libraries feature in Windows 7 makes it easier to manage your files and folders. 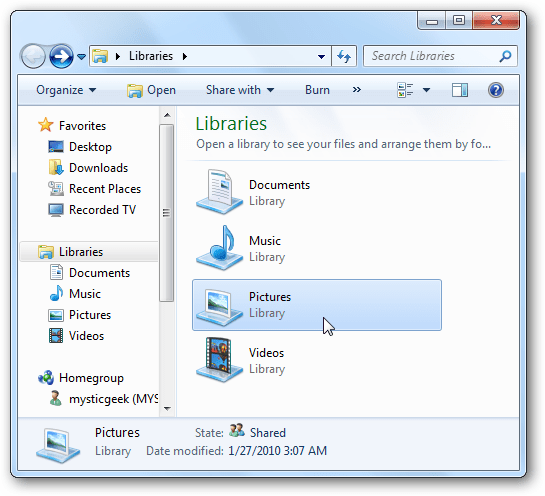 The Libraries feature in Windows 7 provides a central place to manage files that are located in multiple locations throughout your computer. Instead of clicking through a bunch of directories to find the files you need, including them in a library makes for quicker access. To access the libraries in Windows 7, type libraries into the search box in the Start Menu and hit Enter. The default libraries are all well and good, but if you really want to take advantage of this feature, you’ll want to create your own. While in the libraries directory click on the New librarybutton and give it a name.